Ah, the good old days: Remember when network admins used to talk about securing the perimeter of your LAN or WAN by throwing up a firewall and keeping your data safe inside it? Today, all the walls have been knocked down; Internet of Things (IoT) devices and cloud computing have blown large black holes right through our interior and exterior security perimeters. Remember when IT security used to be relatively straightforward? Today, the cloud means big, global threats, with high impact. That’s why many businesses are now outsourcing all or part of their IT security to external consultants whose job is to stay on top of the latest in cyber terrorism. You can outsource critical business functions such as anti-malware, firewall management, network security and database files management. Enterprise organizations are using Security as a Service (SaaS) providers to supplement taxed IT teams struggling to stay up-to-date with the latest threats, while small businesses are outsourcing to Infrastructure as a Service (IaaS) providers that handle cloud computing, data storage, and all the associated security risks that come with that service. In fact, if you’re using the cloud, you’re already outsourcing some of your security to a third party as part of a subscription outsourced security service. Computer Weekly says about 29% of American businesses that use outsourced security firms, adopt a hybrid model where the external service complements their internal teams. Many of these companies believe that the SaaS investment is worth it in an era where cyber threats, like the latest ransomware attacks, are on the rise. Remember that movie, Ransom, where Mel Gibson kicks the butts of some unscrupulous characters and then rescues his son from harm without paying the kidnappers a dime? Ransomware is kind of like that movie, except it’s your computer files are kidnapped. Oh, and even if you pay the fine, you might not get your data back. Wired says ransomware is becoming the hacker’s go-to moneymakers; forget old school identity theft. This is a much more profitable illegal business venture. The FBI says last year cybercriminals netted $24 million from U.S. citizens – and these are just the cases that were actually reported to the bureau. Ransomware is just the latest in malicious malware designed to cause you pain, suffering, and make money for the hacker that’s harassing you. Ransomware is caused when you click on a malicious file that downloads a program onto your computer. The program encrypts your files and places a message on your machine saying to unlock your files you’ll need to pay a ransom. You won’t be able to surf the net, open any files, or run any program until you pay up. Except, just like in real life ransom situations, the hacker may or may not get around to unlocking your computer after you pay the ransom. It’s digital extortion at its finest. Ransomware called “Wannacry” hit hundreds of thousands of business and personal computers in early May 2017. It was the largest global ransomware hit in history. It’s important to remember that ransomware is just malware, so the same techniques that help keep you safe from phishing will help ensure you don’t end up like Mel Gibson. Actually, there is one crucial piece of that movie that you must remember if your computer is infected: Don’t pay the ransom. Krebs on Security suggests that paying up may not release your files. He also suggests that the best way to fight back against ransomware criminals is to run regular backups. So what if your files are encrypted? Just wipe your computer and reinstall your files. That’s an easy methodology to solve a frightening crisis. But Wired says not just any backup will do; make sure you’re backing up in the cloud or to an office storage device or server. That way if the hacker makes it into your server, they won’t be able to access the backup and shut it down with ransomware. How tricky and realistic the email phishing scams are getting. What clicking on one wrong email could do to your company. Setting up a policy for what to do if a mistake is made. External SaaS providers should work to keep your systems patched and updated, as well as running backups, of course. Part of what made the Wannacry virus so effective was because it hit machines through an update patch vulnerability. Users that failed to upgrade, failed the Wannacry virus test, with some tough results. Any outsourced security firm should also have invested in the latest anti-malware systems that stop ransonware or other viruses. These systems are updated constantly in a battle to counteract all the latest moves in the global cyber terrorism chess game. As legacy on-premise platforms are being replaced by the scalability and flexibility of cloud computing, it is imperative to consider security outsourcing. An increasing number of technology vendors are adopting cloud-focused models to deliver subscription security services to businesses of all sizes. Gartner predicts the industry will hit the $4.3 billion mark this year. Topping the list of services includes email gateways and secure cloud data storage. 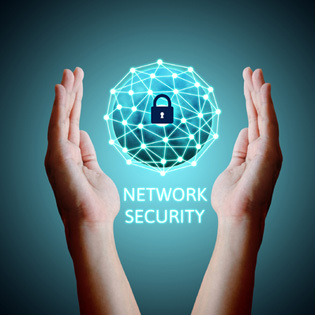 Managing large amounts of data storage, and monitoring your network 24/7 against the most rapidly of evolving threats will grow increasingly important over the next few years. Layering your defenses by training staff in safer emailing, and outsourcing IT security as a supplement to your existing technology team, will help your company keep the data that drives your critical business functions secure. To find out more about outsourced IT security, buy the book ‘Easy Prey: How to Protect Your Business From Data Breach, Cybercrime and Employee Fraud’.